These two pages from Ben and Leanne's wedding album show one of my favourite parts of the day - the time in the morning when the bride and bridesmaids are getting ready. On the left page we can see Leanne, the bride, putting her own earrings in. This is usually a very beautiful and elegant pose, where the bride's own arms help frame her head in the photo. For this image I got really lucky as Leanne chose to put her earrings in whilst facing a large window. The direction of this light means that it's naturally very flattering. 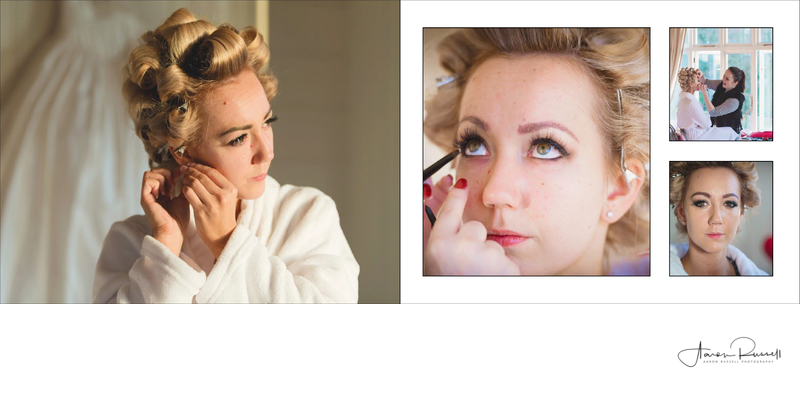 On the left-most image on the right page is a close up of the bride having her eye-liner applied by a professional makeup artist. The top right image on the right hand page shows a slightly more zoomed-out photo of the makeup artist applying the bride's makeup. I chose to shoot this image in this way because with every image being tightly zoomed in, it's easy to think that there's a frenetic energy that's completely based on the bride. Whilst that is sometimes the case, I feel that this image shows a certain air of serenity and peace. It's not all madness in the morning! The lower right image on the right hand page shows an impromptu portrait that I took of the bride at the latter stages of her makeup prep.